This page has pictures of an ankle dorsiflexion machine. Dorsiflexion is the opposite more of pointing your toes or rising onto your tip toes. Dorsiflexion is the motion of bringing your toes towards your shin. The muscles on the front of the shin bone pull the ankle into dorsiflexion, and they help to stabilize the arch. When people have fallen arches or flat feet, the arches tend to collapse and this can decrease stability in the ankles. When the dorsiflexion muscles are stronger, they can help to pull up and stabilize the arches. 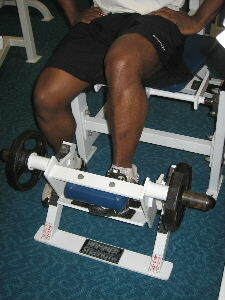 Not every gym has a dorsiflexion machine, but if your gym has one it can help to strengthen your ankles. Starting Position: Most machines are movable, so position the dorsiflexion machine in front of a place you can sit down comfortably. Place one foot into the machine and rest the other foot on the floor. Form: Exhale and lift your toes up towards your shin. Hold for a brief second and then slowly lower to the starting position. Personal Trainer Tips: Move in a slow and controlled manner. The arch muscles tend to be endurance muscles that respond better to slower movements. You can do this exercise with both feet if you choose, but using one foot at a time makes sure that each foot pulls equally. A Better Arch Strengthening Exercise! This ankle dorsiflexion machine can definitely help to strengthen the ankle muscles and support the arches, but it is not the most functional ankle exercise. In real life situations your ankles must be stable when you are standing up. 1 leg balance exercises are a great way to strengthen the arches. If I had to choose only one, I would choose balance exercises over the dorsiflexion machine, but the dorsiflexion machine can be a great way to compliment balance exercises. This is a simple exercise that strengthens the muscles on the front of your shin. 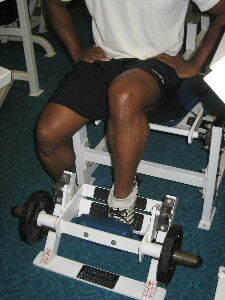 In most people, the calf muscles get tight and strong and the muscles that pull up the shin get weak. It's important to have strong dorsiflexion and shin muscles to stabilize the ankles and support the arches. But remember that 1 leg balance exercises are the best way to strengthen weak ankles.